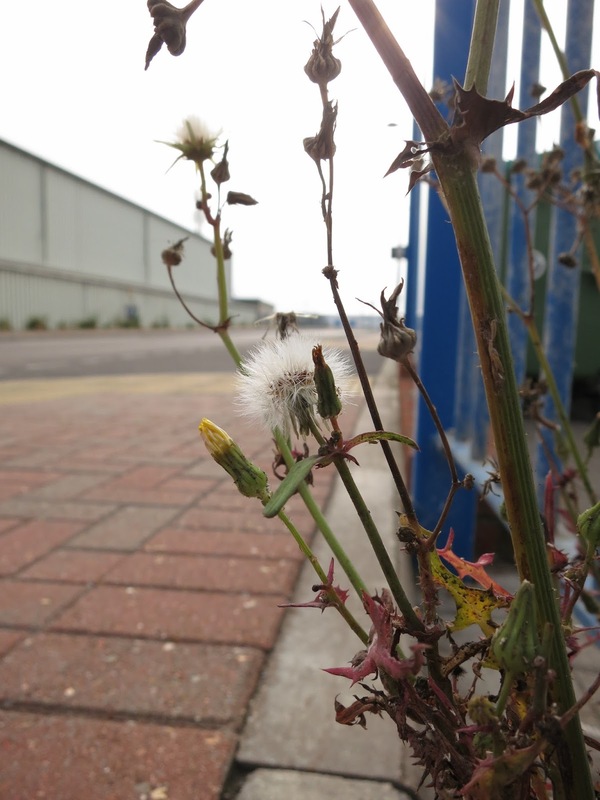 to cast dandelion seeds at the feet of city walls. Some readers will already know my next-door neighbours; Esther Montgomery and her family (her husband Ming and their sons, Worthing and Didcott). They are buying a house bang in the middle of Halifax (Yorkshire; not Nova Scotia!) and have asked if I would like to go too and live in a little flat that has been carved into the attic. This is why I was visiting Halifax last autumn . . . to take a look at the town and the house . . . and things like that. Nothing is settled They are still checking whether all the beams are in place so it doesn't fall down, and that the roof is not so dilapidated they can't afford to mend it. But hopefully . . . If we do move there, it will be a massive change. The south coast of Dorset is, without question, one of the most beautiful places in the world: huge views of deep-blue seas, warm sunshine, dramatic cliffs, sharp storms with raging waves. Skeletons here are Jurassic, not collapsed mills. 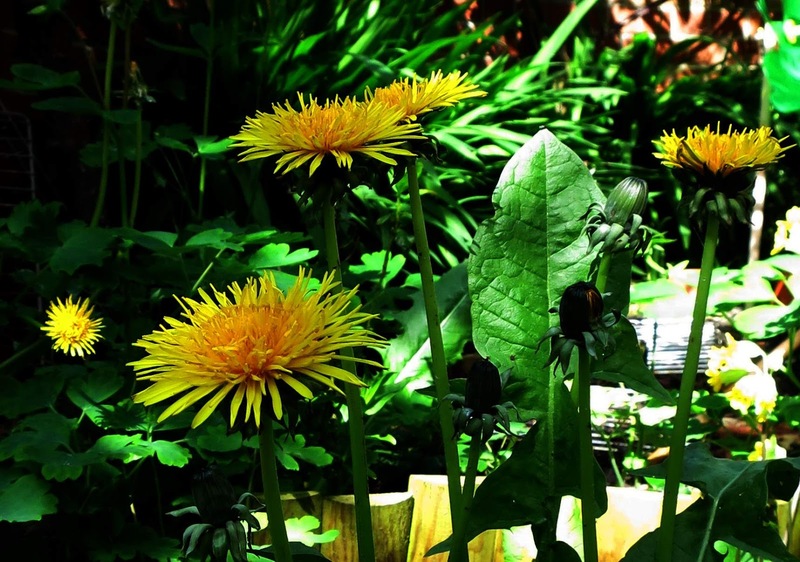 My next door neighbour (Esther Montgomery) treasures wild flowers in her garden. Esther's garden used to be beautiful with roses (they pulled the roof off her shed) and jasmine (it smelled like bubble bath) and clematis (it got scraggly) Spanish broom (plastered with blue aphids) . . . until in the end she had to chop so much down it wasn't beautiful any more. It was a casualty of over-reach; a misjudgement of space. And when I look at the rows of potted plants she's been expecting to take to Yorkshire: bay trees, box bushes, lavenders, geraniums, cordylines, mint, balm, oregano . . . I think she's about to make the same mistake again. It was only when the removal firm advised her that plants cost a lot to move because they can't be piled on top of another) she began to concede she might have to leave quite a lot behind. Perhaps one of the things we might take from it is that you can't fit Kew Gardens into a backyard. And another is how imprecise the definition of 'small' is - it's entirely subjective - probably related to the last house one lived in, or one's dream home or what the neighbours have got. The subtitle is 'Creating Abundance in a Small City Garden' but I don't think Amelanchier lamackii - which grows to about 39 feet high and 13 feet wide would fit into my idea of 'small'. It's not just a matter of space but of light. I often think about this when I see furniture laid out for inspection in department stores and magazines. As soon as you remember there will be a fourth wall, style flies out the window. Whether you are a plant in a garden, or a human wanting a sofa, you'll not survive unless there's enough light to help you grow. But setting the definition of 'small' aside, I think it's a good book for saving would-be gardeners from despair when moving into an urban home with very little outdoor space. And it's for people who've never had a garden before too; people who suddenly find themselves with a few spare feet and are wondering what they might put in it apart from wheelie bins. - Introduce wheelie bins and the answer is probably 'nothing'. I have it in for wheelie bins. Since someone hit on the idea of fooling people into thinking it's 'ecological' to fill the world with these grotesqueries, properly 'small' town gardens have all but been abolished. Books like this, I have noticed, fall into three sections of varying usefulness - a clear start, a list in the middle (which might be useful or might not) and fripperies at the end. So it is with this one. The first part of this book really grabs the attention and gets one thinking. Sometimes these thoughts are of good things - like getting plants to grow in small cracks in walls. Sometimes not so good - like growing parsley in old pineapple tins. Even the illustration in the book shows some parsley looking as if it would prefer to be elsewhere. The middle section is divided usefully into colours and types of plants. (Admittedly with bits of silliness thrown in. Well, I think it's silly to grow geraniums upside down.) Novices are offered answers to questions like 'what is a bulb?' and there are specific plant recommendations - useful for middling gardeners and those struggling with 'downsizing'. What do I think after reading the book? My conclusion is that if just one light and airy and feathery bamboo is all that can reasonably be fitted into a small space - let it be so. And if you have a bit more space than a gate and a step - use it and use it well but don't over-fill. You can be bright and cheerful or stark and elegant but planning is essential if you'd prefer to avoid disease and clutter. This applies to all small gardens - even back gardens where there's room for a table, a couple of chairs and a water 'feature'. For my own part, I do suspect some of the plantings are a bit dense. And I don't take all ideas seriously. Nasturtiums don't grow gracefully - though I love them - and I'm wary when books say things like coffee grounds 'are said' to act as deterrents to slugs. ''Said to' isn't enough. Another thing I've decided is that buying plants in pots, sticking them in the garden for a while, then chucking them away . . . is not necessarily a bad idea. I can hear gasps of horror so I must stress this is me with a new conviction - not necessarily that of the author. People who live in cities and have ultra-small gardens can't always be gardening snobs. For instance, on p.161 there's a display of snowdrops and hyacinths (do hyacinths really need to be staked?) and candles and things, a table, a chair a lamp . . It all looks very pretty but where will you put all this stuff until you want it again next year? Will these plants ever come up again? Un-established snowdrops are certainly a bit iffy second time round. This book about small gardens will be one. Leah Lindeertz' book about allotments another. And maybe the 'Happy Home Outside' (by Charlotte Hedeman Gueniau) because it cheers me up and makes me laugh. Or perhaps I'd regretfully leave that behind. It's one thing to joke about filling one's garden with cushions and carpets and outside cinemas. It's another to imagine not having a garden big enough to not put them in. Already I can feel tears stinging. Do I want to live in a city? Perhaps. Perhaps not. But if I do, I'll take a bit of hedgerow with me and sow dandelions all along the streets - at the foot of as many walls as I can. There are plenty of walls. And plenty of pollution. And plenty of dust. So maybe dandelions would turn their noses up. I hope they wouldn't though. Some are tough. 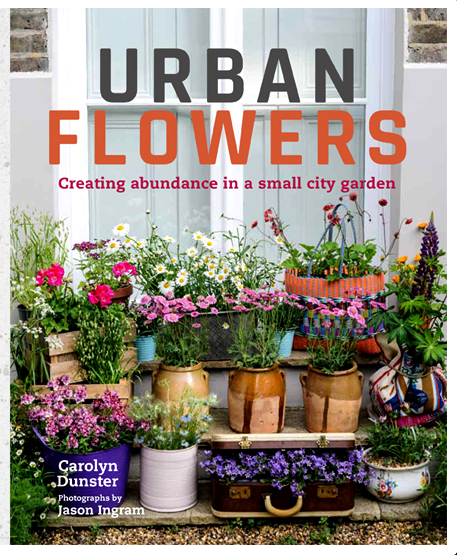 'Urban Flowers - Creating Abundance in a Small City Garden' - Frances Lincoln - £20 - Sent for review in March but not to be published till April 6th 2017. Gosh! That's ages away yet. Enough time for Frances Lincoln (are you listening dear Frances Lincoln?) 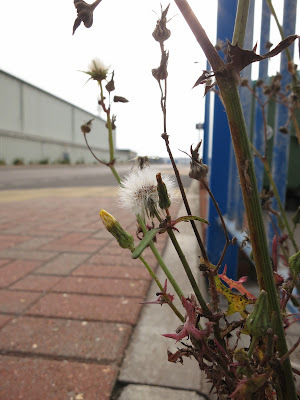 to commission me to write a book about Street Plants! You know - the wild kinds. Hello Val. Sometimes I feel excited about the idea of moving. Sometimes I feel frightened. Sometimes I look at the sea and wonder how I could ever bear to leave it Sometimes I look around and think I'm ready for something new. Hello Lyn. That would be great! Getting to know the countryside around Halifax will be wonderful. 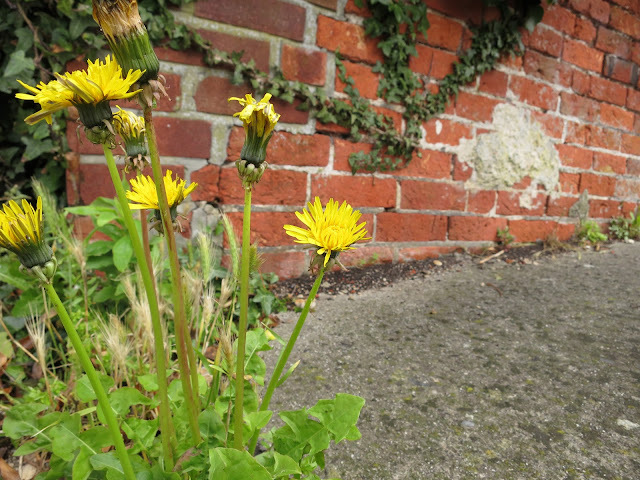 Finding plants in the town itself may be a bit of a challenge; though come to think of it, I've only been there in the winter so that wasn't giving it much of a chance on the floral front! Yep, "not in the book" vegetation is something you take beautiful photos of. Some say that "change" is good. Maybe it's time to start a new adventure. Glad you enjoyed the review Pat. Hi Lucy your blog appears to have dropped off my email list. I will sign up again, did you stop blogging for a while? Sounds like you may be beginning a new, exciting chapter in life. I trust it will be wondrous. Hello Brian. I've been blogging erratically because 'technology' has been letting me down somewhat . . . laptop breaking . . . and, currently, camera breaking. And with each 'breaking' there is a gap between the 'break' and having the necessary funds for replacement or repair!